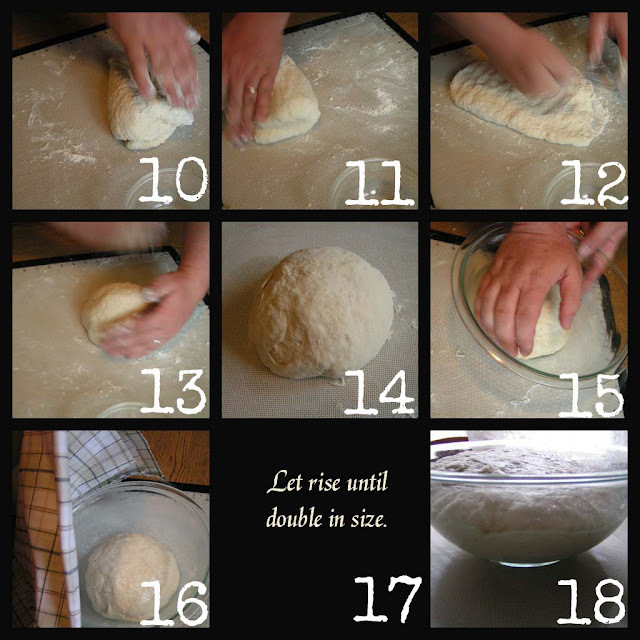 The Best Pizza Dough – a photo tutorial packed with tips on making the best pizza at home! Today we are taking the mystery out of making pizza dough. Trust me when I say, it’s easy-peasy. Or what my Hubby says, because he is going to show you how you can make a pizzeria-style pizza at home! I should warn you though, after trying this pizza – you may never order delivery again. Hi everyone! Mr. CCS here. 🙂 Hope you are ready for a photo loaded tutorial. I am going to show you how to make pizza at home. We did our best to photograph every step so there is no mystery involved. Note: the sugar and yeast are very workable depending on room temperature and how long you have to wait. If you have hours and hours you don’t need much yeast, but with my patience, I use a bit more than necessary. 1. Have your ingredients ready. 2. Combine all in a large bowl. Stir gently to help the yeast to dissolve. 3. Let it sit for about 10 minutes until you see bubbles forming on the surface. 4. Gather the rest of ingredients: 3 cups of flour, a pinch of salt and 1 tablespoon oil. 5. 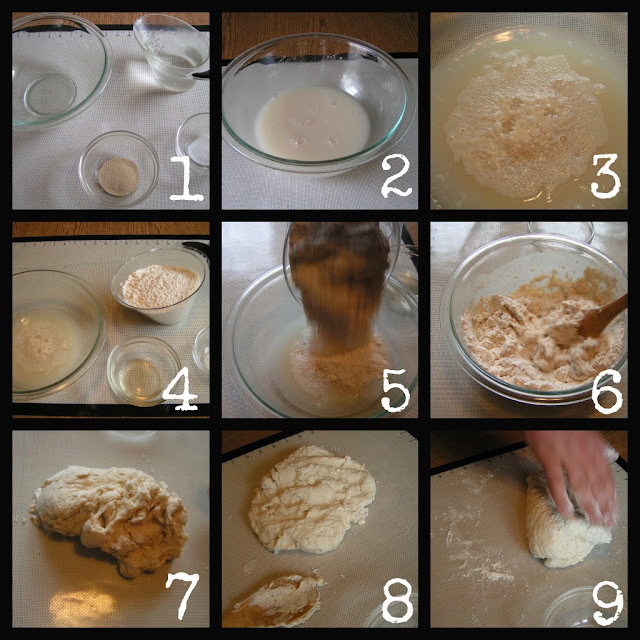 Add flour to your yeast mixture. Begin with 3 cups of flour. It might be enough but you will know as you work with the dough if you need a bit more. Not enough flour and it will stick to the counter, your hands, rolling pin etc..
6. Sprinkle the salt over your dough and add the oil. Stir until the dough forms and separates from the sides of the bowl. 7. Turn the dough onto a floured surface or baking/pastry mat. ( or some nonstick mat my wife uses for her modeling chocolate decorations ). 9. Now the fun begins! You get to fold and punch the dough! HOW TO KNEAD PIZZA DOUGH? 10. Fold from right…. 11….. to left… 12. … punch down… 13…. really doesn’t matter just eventually form into a ball. 15. Clean the bowl you mixed the dough in and coat lightly with cooking oil. Place your ball of dough inside. Turn it few times to coat the dough with the oil. 16. Cover the bowl with a cloth or a towel. 17. Let rise until it doubles in size. A tip my wife taught me is on a cold/cool day to heat up a cup of water in the microwave and then placing my dough inside. Not a problem right now with the heatwave we are going through in the Midwest ;). In theory you want your dough to rise as slow as possible at cool temps such as a refrigerator overnight but in reality, I am unable to plan that far ahead and need to spend as little time on prepping dinner as possible. 18. This is how your dough should look like after rising. HOW TO FORM PIZZA DOUGH? 19. Turn your dough back onto the floured surface or a mat. Flatten down. 20. Form it into a log…. 21. …like this. 23. Form each part into a ball and let sit a few minutes. In the meantime, preheat the oven to 425 degrees F.
24. One by one, flatten each ball into a disk. 25. After hand flattening to a circle use your rolling pin to get it as thin as you are comfortable handling and it staying together. Your dough will be pretty flexible and if it does rip or develop a hole, you can fix it as it is very forgiving. Simply fold over where it ripped or take a little piece from a thicker part of the dough and smash it in. Worst case scenario: roll it all back up and roll it back out again. I try to roll it out as circular as I can and as close to the size I want so I don’t need to stretch it out a whole lot to get to my edges. You don’t need these pizza pans. Freeform pizza works even better and is much easier, but my kids are familiar with commercial pizza and believe that the perfectly round pizza tastes infinitely better. 26. Have your pizza pan SLIGHTLY greased with cooking oil or sprayed with it. Place the pizza dough on top. 27. Now here is the trick: use both hands to create the edges. With one hand pushing /squishing the dough towards the edge of your pan and over and the other hand flattens it so it will stay in place. HOW TO FORM PIZZA DOUGH IN PAN? 30. After you form your crust it needs to proof a bit; you can do this by letting it set for a while or pop it in the oven for about 5 minutes, pull it out and then add your toppings. 31. Your crust is ready to be finished and topped. 33. … and sprinkle with cornmeal. 34. Spread the sauce in a circular motion. 35. …until it’s nice and coated. 36. Top with your favorite toppings and bake 15 – 18 minutes. Enjoy! I hope you will give it a try and prove to yourself you can make a great pizza at home! Update 03/2014: If you want a thin crust pizza – cut the dough into three parts. If you like thicker crust – divide into two parts. Also, check out our Homemade Pepperoni Pizza recipe for more tips! So how about that, huh? 🙂 Now you know one of the reasons I love this man. He makes the best pizza ever!! The BEST PIZZA DOUGH tutorial! 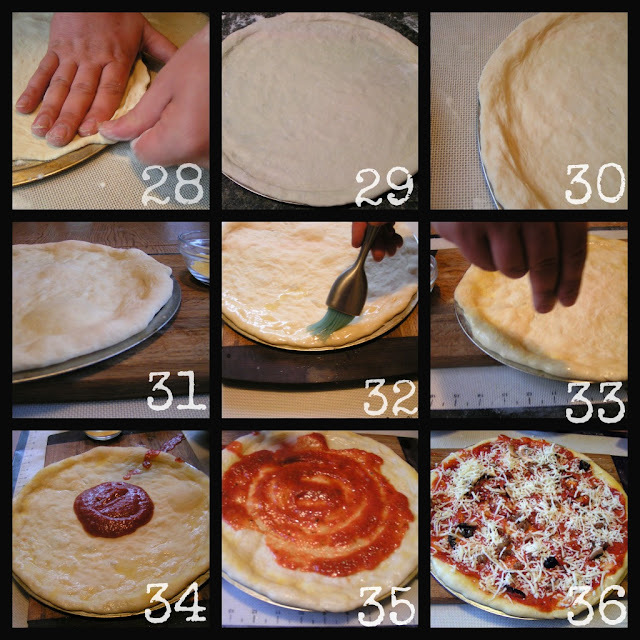 Step by step photos show you how to easily make the best pizza dough at home. Top with your favorite toppings and enjoy! Check out the comments on our post from readers who make this recipe all the time and love it. Place water and sugar in a large mixing bowl. Stir until sugar dissolves. Add 2 cups of flour and salt. Mix in with a wooden spoon until combined. Add third cup of flour and stir it in with a wooden spoon. Place dough onto a floured surface and knead it the last cup of flour. Knead the dough until smooth and no longer sticky. It should be smooth. Place the dough into a oiled large bowl, cover with a kitchen towel. Place in a warm and draft-free place until doubles in size, about 1 hour. In the meantime, prep the pizza pans by lightly greasing them and sprinkling with cornmeal. Punch the dough down. Transfer back onto the floured surface. Smooth out into a ball. Roll out one piece into a circle, about the same size as your pizza pan. Place on the pizza pan, stretching the sides. Place the pizza dough in the oven and bake for 7 minutes. Brush the sides of the pizza with melted butter and sprinkle with 1 tablespoon of cornmeal. Top with toppings and bake 12 to 15 minutes. This recipe makes 2 large pizzas. The calorie count is an estimate. I use MyFitnesPal app. I just read your Post I Love Pizza Even I when I buy Pizza from the Store I put my own sauce on it and Add more Meats add Veg’s and different Cheese.It is good .But from here on I will be Making my owe Crust.Thank You and Your Husband. No salt is listed on ingredients. Only in instructions. How much salt is needed? Hi Carey! It should be 1/2 teaspoon. Hope this helps! Yumm!!!! Me and the kids had so much fun and it was very delicious! I’ve got my dough rising now. I just looked at the print recipe and it says 1 TBSP oil but this tutorial says 1 tsp…. Which is correct? Hi Lulu! 1 tablespoon is the correct amount. I’m just about to start a double batch of this now. One batch for the pizza and a batch for garlic knots. My kids are going to love me! Betcha I even get a hug and kiss out of it! Hi Laura! It’s Friday so we are whipping up a batch too! Yay for pizza nights! Let us know how you like it! Thank you for the comment! I just made this pizza dough…..I couldn’t believe how soft the dough was. When I formed it into a ball, it felt like I was holding a pillow. The dough was enough for 2 large pizzas…..I have the big 16″ pans. Thank you so much for this recipe! This was easy to make and I’m sure it will be delicious! Hi Ed! Thank you so much for the wonderful comment and for trying our recipe! We make it every week on Friday and love it too! Thanks so much! Hi Tanya! We used 12″ pizza pans. This recipe makes three thin crust pizzas or two thick crust pizzas. I think you should have no problems making 2 16″ pizzas. Let me know how it goes! Thank you! Just came across this recipe on Pinterest. I LOVE pizza. I have tried 3 other pizza dough recipes and so far this one IS THE BEST. (Also the first one I’ve used with yeast) Fantastic! Thank you for sharing!! Hi Amanda! Thank you so much for letting us know! We make this recipe almost every week! We did last Friday! It’s fantastic to know that others love it too! Thank you!! Hii –quick question. 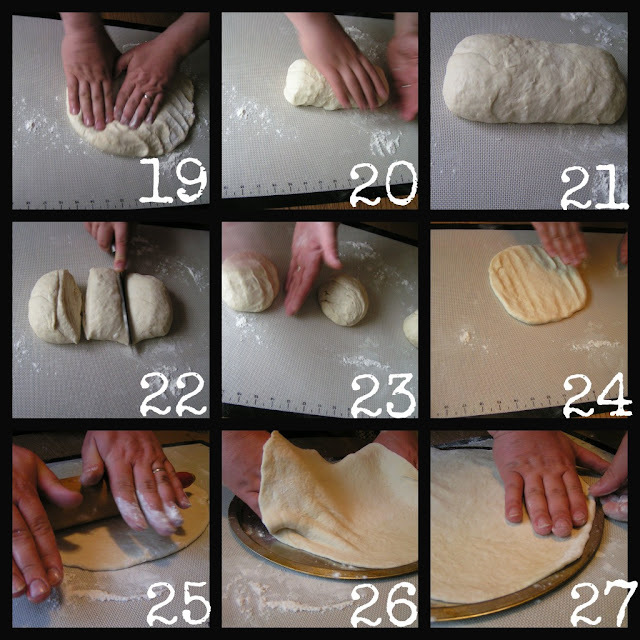 You mentioned that in step 22-24 you roll the dough into three balls/disks. Do you then have three different pizzas, or did you roll all the disks together with the rolling pin after you separated them? What’s the point of separating the dough? Just wondering-I’ve never made pizza dough and I’d like to try it. They made the pizzas. He said you can do three pizzas or freeze the other two disks and that they keep for a while. Hope that helps. This is an awesome find! Thank you!! I don’t see an oven temp. Am I missing it? Thank you. It’s 425 degrees F. Thanks, Melissa! I'm keeping this post close for my next pizza night! Great tutorial. I love making pizza but I can never seem to get the base round! Awesome tutorial! Great job to both of you…I'm sure this is yummylicious! Nothing beats homemade. Such a brilliant post! I love making pizza dough but I don't make it nearly as often as I should. There's nothing like a good pizza. We also made pizza for dinner tonight. I've been wanting to make my own pizza for ages but never got round to it. I recently bought a pizza stone and it's still in its box. Thanks for this helpful photo tutorial – I can't wait to try it out! You are very welcome! Let me know how you like it!